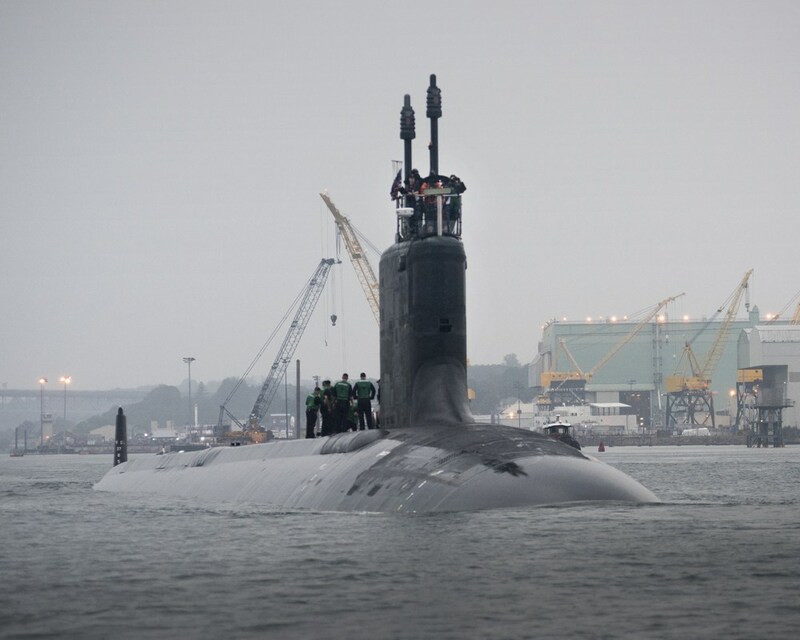 Huntington Ingalls Industries (HII) announced on August 9 that its Newport News Shipbuilding division has reached a major milestone in the construction of the submarine USS Indiana (SSN-789). 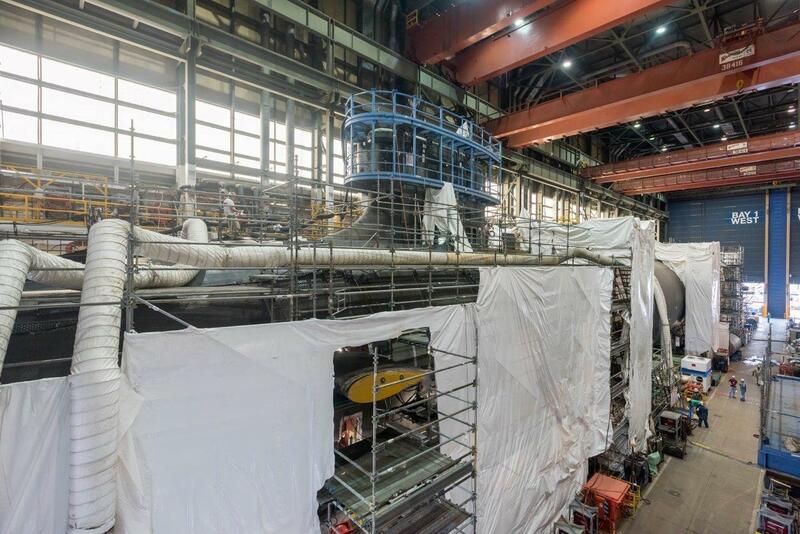 The 16th Virginia-class submarine has reached «pressure hull complete», signifying that all of its hull sections are joined to form a single, watertight unit. Ship’s Sponsor Diane Donald, wife of Admiral Kirk Donald (U.S. Navy, Ret. ), and Ray Shearer, chairman of Indiana’s commissioning committee, visited the shipyard to see the progress being made on the submarine and meet with its crew. «Witnessing Indiana come to life is one of the most gratifying experiences of my life», Mrs. Donald said. 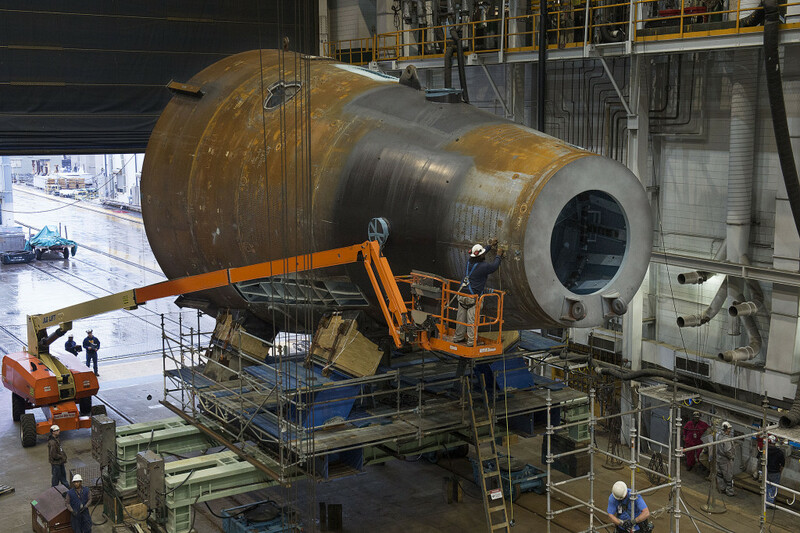 «The countless hours of hard work the shipbuilders have put into constructing and perfecting this boat is apparent, as Indiana has now taken on the shape of a submarine. I also had the pleasure of spending time with the ship’s crew. As the wife of a submariner, it’s been a real honor getting to know a new generation of sailors and witnessing their enthusiasm and dedicated service to our nation. As Indiana moves closer to joining the Navy’s fleet next year, I look forward to continuing to share this journey with her shipbuilders and crew members». 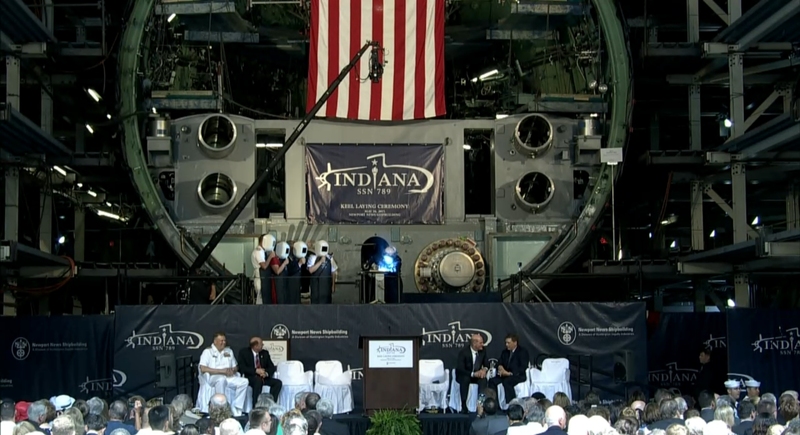 Pressure hull complete is the last major milestone before the submarine’s christening. Construction began in September 2012 under a teaming agreement between Newport News and General Dynamics Electric Boat. The submarine is about 82 percent complete and is scheduled for delivery to the Navy in the third quarter of 2017. «We are on track to meet our budget and schedule commitments to the Navy, and I’m proud of the progress that the Newport News Shipbuilding-General Dynamics Electric Boat team is making», said Jim Hughes, Newport News’ vice president, submarines and fleet support. «Our progress demonstrates the efficiency of the Navy’s two-per-year build plan, which helps ensure America’s undersea superiority». Commander Jesse J. Zimbauer, Indiana’s commanding officer, said, «Newport News Shipbuilding has completed the pressure hull on time for the Indiana, continuing the momentum of the Navy’s most successful build program and moving us another step closer to taking our submarine to sea». The keel of the 16th Virginia-class attack submarine, named after the 16th largest state, was laid May 16 at Newport News Shipyard. She is the third ship to bear the name Indiana, and will be the first in almost 70 years to sail under the national colors with that name. It is said in the Navy Times that the ship’s sponsor, Diane Donald, the wife of retired Admiral Kirk Donald, a former director of Naval Nuclear Propulsion, declared the keel «to be truly and fairly laid». Diane Donald authenticated the keel with her initials, which were welded onto a metal plate and permanently affixed to the ship. Construction on Indiana, the sixth of eight Block III variants, started in September 2012. The state is known as «the crossroads of America», and its namesake honors that motto well. She carries millions of parts from 5,000 suppliers located in all 50 states. 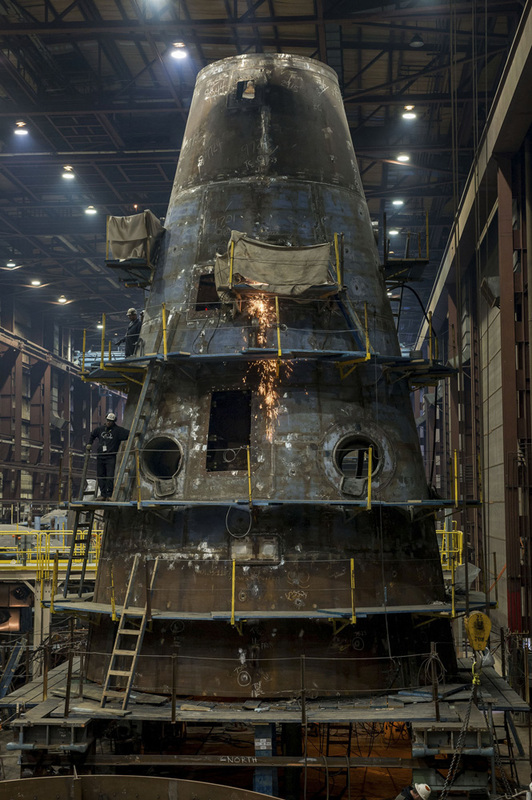 Assembling these parts is what Jim Hughes, vice president for Submarines and Fleet Support, called «one of the biggest orchestras in the world». The symphony carefully played by 4,000 shipbuilders will now unite hull sections into a 377-foot/114.8 m military masterpiece that will crescendo with its 2017 commissioning, then slip into three decades of silent service. Her missions will be many and multifaceted. The Virginia class has a large lock-in/lock-out chamber, and a reconfigurable torpedo room to accommodate more snake eaters. She will carry roughly three dozen Tomahawk cruise missiles. Traditional periscopes have been replaced by photonics masts with high-resolution cameras and infrared sensors. A fly-by-wire ship control system provides unmatched operation in shallow littoral areas. While the Virginia class boasts these and other upgrades in weaponry and other tactical equipment, its biggest edge is in acoustics, said Commander Jesse Zimbauer, the ship’s skipper. Among its many advances, the Block III variant vastly improved passive detection by replacing the traditional sonar sphere with the Large Aperture Bow array. «We are building the future with this submarine», said Jesse Zimbauer, who «jumped on the opportunity» to be part of the pre-commissioning unit. A keel laying is the symbolic beginning of building a ship, originating from the large structural beam, or keel, that serves as the foundation or spine of the ship’s hull. Although modular construction techniques mean that the ship is no longer built from the bottom up, the keel laying is still celebrated as a momentous event in the ship’s construction. 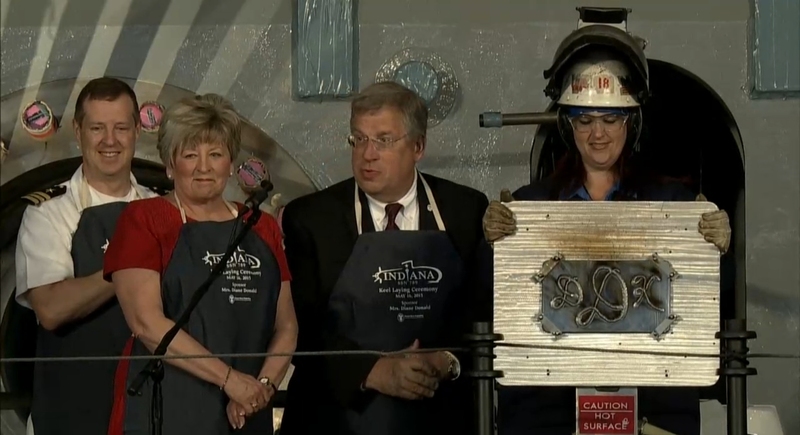 During the keel laying ceremony, the ship’s sponsor authenticates the keel by chalking her initials onto a metal plate. The initials are then welded onto a plate that is permanently affixed to the ship.